It was March 1998 when, during a routine exchange of messages on the "CLASSIC-COUGARS" email list service, someone suggested a meeting of "cats" in the Washington, D.C., metropolitan area. At first, the idea didn't get much of a response and only four people in the immediate Washington area showed interest in the proposed meeting. Then, cat fans south of the Potomac chimed in. Cougar enthusiasts from central and southern Virginia jumped to attention. They wanted to enjoy the company of fellow Cougar fanatics in the region and soon an addictive excitement began to build for a "Mid-Atlantic Cougar Cruise-In." 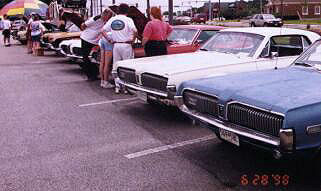 After an exchange of email messages between interested parties, it was decided that, given the number of Virginia residents involved, the group would meet in Richmond, Va. And so, on June 28, 1998, 13 classic Cougars stood toe-to-toe with the all-new, 1999 Mercury Cougar on the lot of Capitol Lincoln Mercury of Richmond. 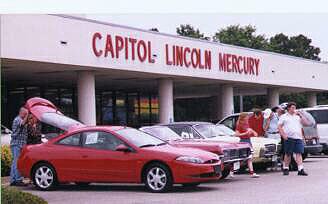 Capitol agreed to sponsor the cruise-in as a way to promote the '99 cat. To that end, the dealership provided hot dogs, drinks and a warm atmosphere for the Mid-Atlantic Cougar enthusiasts to meet and compare notes. Capitol provided one other important amenity: use of its dealership conference room, in which the cat enthusiasts met to talk about establishing a regional Cougar club. Within an hour, they decided to do just that. They traded contact information and agreed to use the Internet to stay in touch and to select officers and conduct other business necessary to bring to life what ultimately would become the "Delmarva Cougar Club." At the end of the day, the cat fans parted, but they looked forward with great optimism for more meetings and other club activities with their new cat family.